By Shauna Irwin | February 27, 2013.
nature never cease; but what about wonders that are created? Those that are man-made? Few would think to look for one of these wonders in a car park on Francis Street, Dublin 8. However, here is where you will find one. 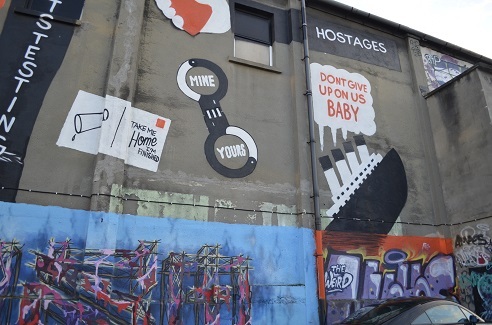 The Tivoli Theatre car park has become a playground for artists, a place where they can spill their art across the walls and to let their sentiments ring out. ‘You can look down on me as long as you look at me’ is the phrase that greets the graffiti admirers at the car park entrance. These graphic slogans are accompanied by realistic portraits. One stands out – a haunting animated image of a girl standing alone. Underneath is the message ‘In loving memory of our dear friend’. Graffiti Hall of Fame,” he said. The Graffiti is carried out by graffiti artists at the annual All City Jam which has been occupying the Tivoli since 2008. The organiser, Olan, is the owner of Dublin’s own All City Records in Temple Bar. The jam is a dynamic gathering, with more than just graffiti artists coming together. The jam was set up by Olan independently of the Tivoli Theatre itself, though before the All City Jam, some graphers had already started to colour the walls. This nabbed the All City founder’s attention. Two of these were famous European writers Flying Fortress and Nychos who did the main ‘lynchpin’ of the wall. Some of the Irish writers that graced the jam last year included Rask, Kube, Omin, Scie, Gone and Pot. Though it seems the weather wasn’t a deterrent for any of the artists last year, who gathered at the jam gather to showcase their talents despite the Irish climate. The current Graphics will remain in the Tivoli until the upcoming All City Jam this spring. The jam will see a range of new artists, and according to Olan it will be at its best ever.